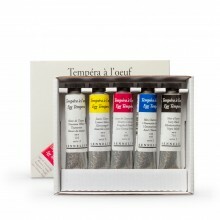 Tempera, or egg tempera, is a clear, bright water-based paint that has been used for hundreds of years. It was the preferred medium before the invention of oil paints and one of its advantages is that the colour doesn’t fade with time. Tempera is best applied in thin layers to a rigid surface, such as wood.